Philippe Wahl is a graduate of IEP Paris with a Research Masters Degree in Monetary and Financial Economics and is a former student of ENA. From 1984-1988, Mr. Wahl served as an auditor and then Master of Requests at the French Council of State. Between 1986-1988, he was the project leader for the Chairman of the Commission’s office of the French Stock Exchange. In 1988, he joined the Prime Minister’s office as Advisor, responsible for Monetary, Financial and Tax Affairs. Mr. Wahl was appointed Advisor to the Chief Executive Officer of the Compagnie Bancaire in 1991 and subsequently became a member of the Management Committee in 1992, then Deputy Chief Executive Officer in 1994. In 1998, he became Head of Paribas’ Specialist Financial Services Division and a member of its Executive Committee. In 1999, he was appointed Chief Executive Officer of the Caisse Nationale des Caisses d’Épargne Group. In 2003, he is founder and partner of SOLFI (strategy consulting) until 2005. Mr. Wahl became Chief Executive Officer of the Havas Group in 2005 and then Vice-Chairman of the Bolloré Group in 2006. The following year he was appointed Chief Executive Officer of RBS’ French subsidiary and later Advisor to the RBS Global Banking and Markets Board in London in 2008. By 2009, he became Chief Executive Officer of RBS’ French, Belgian and Luxembourg subsidiaries. Mr. Wahl was appointed in January 2011 Chief Executive Officer of La Banque Postale’s Executive Board and Deputy Executive Director of La Poste Group, Member of the Executive Committee. 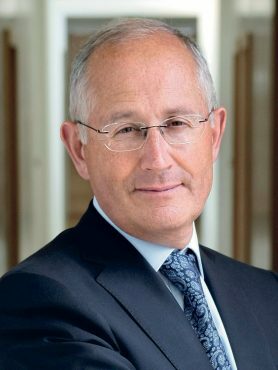 Mr. Wahl becomes Chairman and Chief Executive Officer of La Poste Group in September 2013 and Chairman of the Supervisory Board of La Banque Postale in October 2013. He was appointed Executive Vice President of the silver economy steering committee in December 2016.